Are regular stainless steel captive rings, just a little on the safe side? Are you looking for something a little more rugged? Look no further, our 10g (2.5mm) ½” (13mm) industrial captive ring with drilled holes is the ring you’ve been looking for. The base of these rings is a 316L ASTM F-138 Implant Grade Stainless Steel and is plated to give the ring its brilliant, high shine coloring. 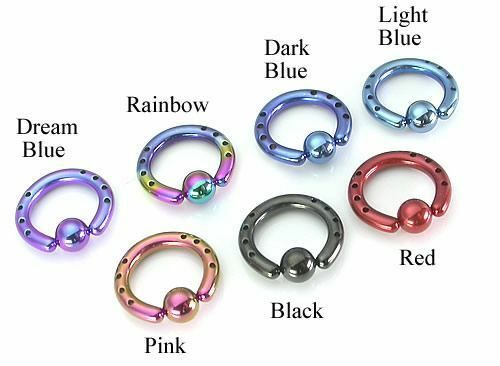 Available colors: Black, Dark Blue, Dream Blue, Light Blue, Pink, Rainbow and Red. The 5mm captive ball is made of the same material for a uniform look between ring and ball. Rings are priced per 1. This rugged yet classic ring will be the perfect addition to your jewelry collection!